Well researched and appropriately documented, Back to School is indeed groundbreaking study that deserves the attention of board leaders, school administrators, teachers, parents, professors and Jewish education, and all others concerned about the state and growth of Jewish day schools. Back to School began as an ethnographic study of the Paul Penna Downtown Jewish Day School (DJDS) in Toronto, a private, religiously pluralistic day school that balances its Jewish curriculum with general studies. Drawing on a longitudinal study at DJDS, and against the backdrop of a comparative study of two other Toronto day schools as well as four day schools from the U.S. Midwest, Pomson and Schnoor argue that when parents choose Jewish schools for their children they look for institutions that satisfy not only their children’s academic and emotional needs but also their own social and personal concerns as Jewish adults. The authors found an uncommon degree of involvement and engagement on the part of the parents, as genuine friendships and camaraderie blossomed between parents, faculty, and administrators. In addition, the authors discovered that parents who considered themselves secular Jews were introduced to or reacquainted with the depth and meaning of Jewish tradition and rituals through observing or taking part in school activities. Alex Pomson is a senior lecturer at the Melton Centre for Jewish Education at Hebrew University, Jerusalem. Randal F. Schnoor teaches at the Centre for Jewish Studies at York University. Back to School: Jewish Day Schools in the Lives of Adult Jews is highly recommended for anyone who wants to improve the education of the leaders of tomorrow's world, especially for those of Jewish faith." In their ethnographic study, Back to School, Alex Pomson and Randal Schnoor have made an important contribution to our understanding of the powerful role Jewish day schools play as a source of meaning in the lives of adult Jews. Back to School should remain a significant foundational research contribution for many years to come." 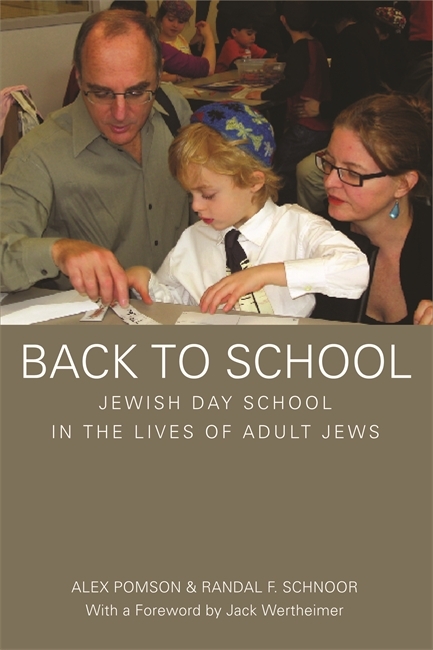 This important work summarizes, in an engaging, highly readable manner, research that demonstrates convincingly that the Jewish day school plays a vital role, not only in the educational, social, and religious lives of its students, but, surprisingly, in the lives of many adults who send their children to day schools. Well researched and appropriately documented, Back to School is indeed groundbreaking study that deserves the attention of board leaders, school administrators, teachers, parents, professors and Jewish education, and all others concerned about the state and growth of Jewish day schools." The strength of this book, and this research project, is that it has opened up a conversation about the richness of Jewish life that is taking place in Jewish day schools, not only within classrooms and offices but 'around the school.' This is a critical conversation for researchers attempting to understand better changing educational and religious configurations as well as practitioners reaching out to and working with families." Back to School is both interesting to and challenging of many dominant assumptions about the relations between schools and parents. A genuine contribution to the field.